It feels as if 2013 started just the other day......and now more than half of the year has already passed and we are hurtling towards the end with hectic speed! 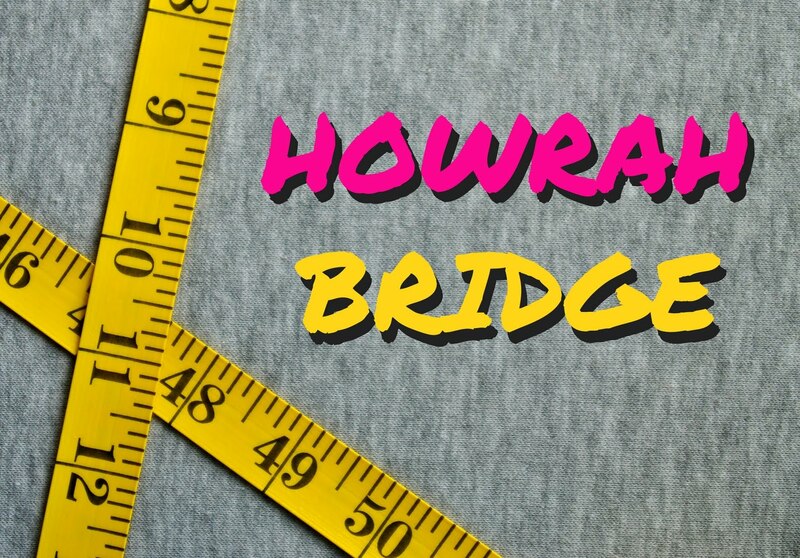 I started working on the AW '13 collection of my brand, Howrah Bridge, yesterday.....and that's when I realised how soon & how suddenly we are already transitioning from Spring-Summer, i.e. florals, shorts, sun-dresses, chilled drinks, shades, sunscreens & beach holidays; towards Autumn-Winter, i.e., layering, hot chocolate, cosy rugs, chunky knits, rugged boots, chilly winds, moisturisers & of course, Christmas! Well.........for now, Autumn's knocking on the door, waiting to show Monsoons their way out....and I can't wait for Autumn to come as it brings with it my most favorite festival of all times - Durga Puja!!! But before that, I'm absolutely dying for the 21st of August to come........coz that's the day I'm going on my trip to Bombay, with friends, to chill & have fun at Lakme Fashion Week AW '13!!! A week full of friends, fashion & fun beckons.....and I'll be reporting live from one of the most happening fashion events of the country for all of you guys! 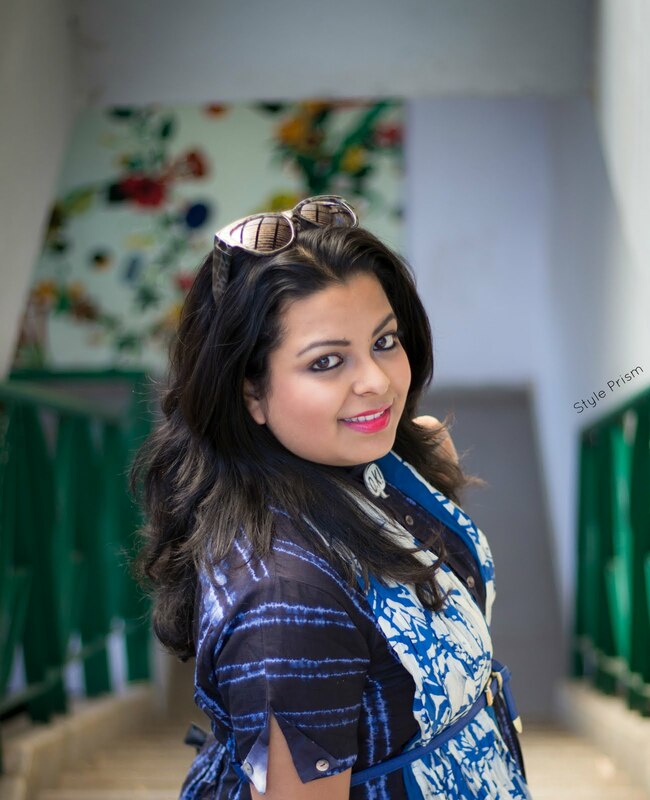 So don't forget to follow me on Facebook, Twitter & Instagram for fashionable news & views straight from the ramp! This gorgeous portrait of an idol of Goddess Durga was one of my most favorite photographs over there! Have a lazy-crazy Sunday folks!!! you are transformed in front of camera....no longer the shy girl!!! Your hairstyle and smile are amazing. 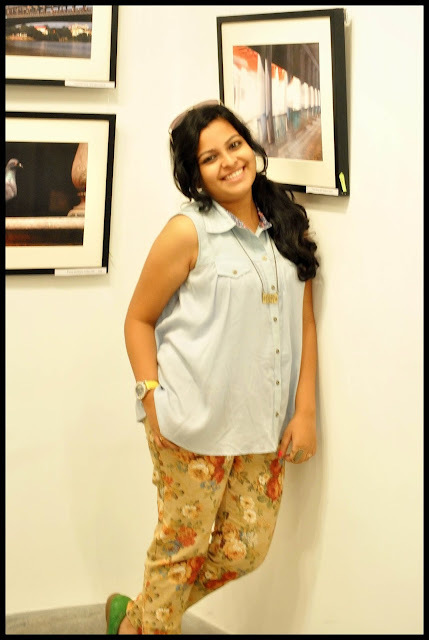 This casual outfit is very nice with the floral pants, sleeveless shirt, and loafers. You have sunny style even if the weather around your way is anything but. Great post! You're right! The photos are perfect backdrops for your outfit! DG I love your floral print pants. You carried it really well and you look amazing in all the pictures. All the best for your AW'13 collection. I'm sure your collection will be as good as you have it in your store now. I am happy for you that you are going to Bombay for the Lakme Fashion Week. I am sure you will have a really good time with your besties. It looks very cute... n indeed inspiring! i love these pants..love the look! Would you like to folow each other? You've finally taken the plunge on red lipstick? Oh, Anu, I'm so proud! It's addictive, honestly - once you have one, you want to have ten, as my lipstick collection clearly shows :) I hope we'll get to see you sporting it soon, but in the meantime, could you be any prettier in these photos? I think not. 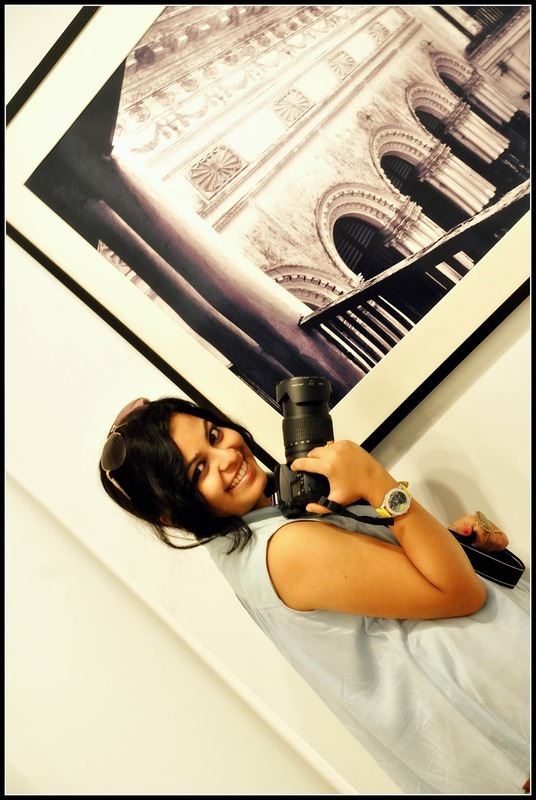 Dibakar captured you beautifully. 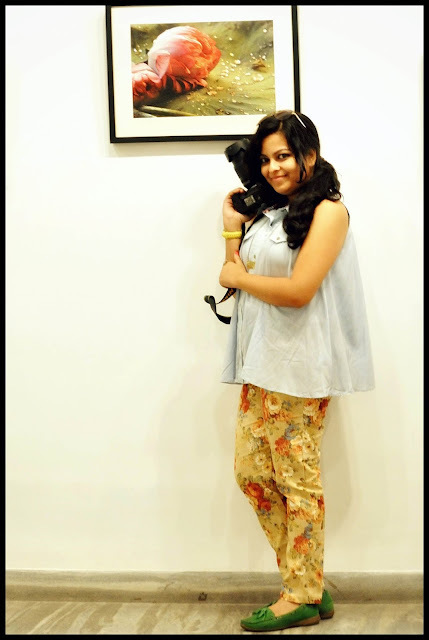 Have an awesome time at fashion week Anupriya!You look really pretty in the floral pants! Nice post! and love your comfy outfit! Oh my goodness you look adorable! LOVE those trousers :) Hope working on the brand goes well, would love to see what process you go through to do it! 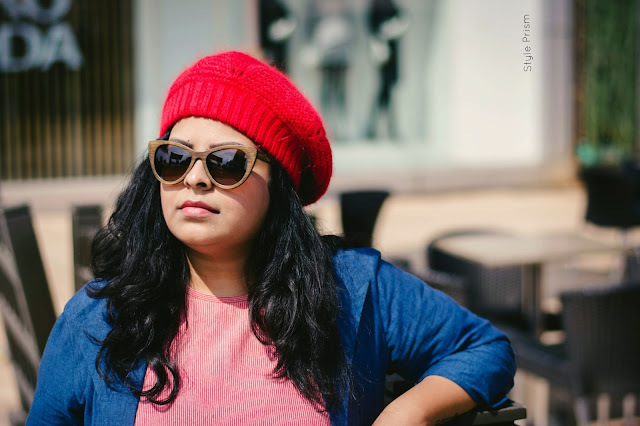 I hope you have a truly wonderful time at Lakme fashion week. You're right, this year is hurtling past at great speed. seems like only last week that the new leaves emerged on the trees and now it's not so long until the onset of autumn. Great floral trousers. Enjoy fashion week, my friend. 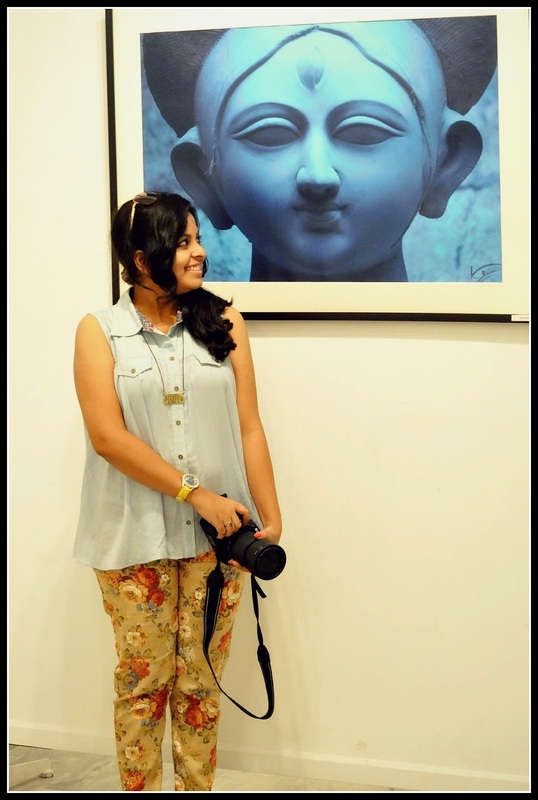 Is this the exhibition Shreya and you were talking about that day? Well,the pictures are lovely and so are you. Can't wait for your Bombay posts since the teasers left me asking for more,to say the least! P.S. I'm so going to steal this pendant of yours some day! Polka Princess, I am so proud of all your hard work and impending success! You look fabulous- I love that jacket, and are at ease as a Fashion Week fashionista.